Next Step for Capstone Papers? Now that fall capstone presentations have been completed for this semester, our capstone students might want to consider submitting their capstone papers for potential presentation at the Midwest Political Science Association meetings in Chicago in April. The MPSA has long welcomed undergraduate research presentations. To quote the MPSA, “if you have undergraduate students who are writing capstone research papers, please let them know about the two undergraduate poster sessions at the MPSA.” The deadline for proposals is fast approaching: December 7. For further information, see www.MPSAnet.org/conference; students should also confer with their capstone director and/or academic advisor. The Department has funding to support any student whose paper is accepted for presentation at the MPSA meetings this spring (April 4-7, 2019). Good News. It is my pleasure to share that news that our Adjunct Professor of Political Science, Jonathan Entin, David L. Brennan Professor Emeritus of Law, had been appointed as the University’s new Conciliation Counselor. Professor Entin was appointed by Provost Ben Vinson, and the appointment was confirmed by a vote of the Faculty Senate. Congratulations to Professor Entin! Congratulations as well to our former colleague, Professor YuJung (Julia) Lee, for her article, “It’s World Toilet Day. Why do so many people lack adequate sanitation facilities?”, published in The Monkey Cage in the Washington Post. The article is based on Professor Lee’s dissertation and the field research she undertook in India. Departmental Productivity. The Department of Political Science, with few faculty, is nonetheless a highly productive faculty. We present scholarly papers at national and international conferences; we publish articles in highly ranked disciplinary journals; we give interviews to the media; we publish blog posts (on our own blog sites or for well-known disciplinary sites). Our research is also published as books, and in this regard, we are impressive as a faculty. 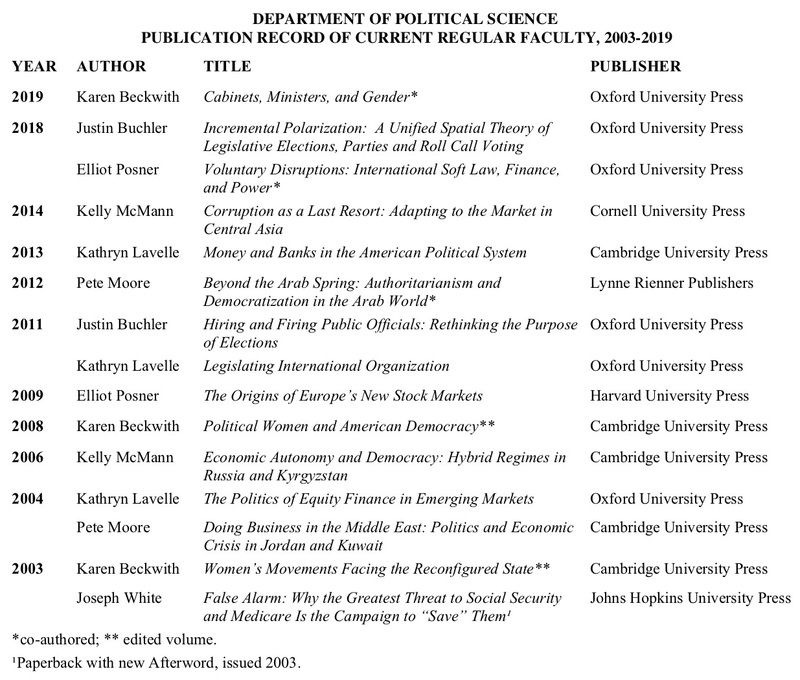 The following lists the books published by the POSC faculty since 2003; it does not include other work in progress that is likely to be forthcoming as books in the next two years. The quality of our work is evidenced by the quality of the presses that publish our work; see here for a ranking of presses that publish in political science. I was pleased to share this information with Provost Vinson in our recent meeting. Thanksgiving. Thanksgiving Day is a federal holiday, and the Department offices will be closed tomorrow and Friday. Thanksgiving Day was not always celebrated as a national holiday, recognized intermittently until it was confirmed by Congressional legislation, with a permanent date, in 1941. Despite the multiple controversies around Thanksgiving, it strikes me that a national myth celebrating peace and mutual assistance amongst diverse peoples is not a bad thing to celebrate this year. As displaced persons seek refuge and asylum from war, violence, hunger, and disaster, around the world, the United States has, for all its real ills and challenges, a history of welcoming the displaced and those seeking asylum here is worth acknowledging and celebrating. This documentary presents a troubling portrait – and indictment – of the U.S. government’s dismal failure to provide health care in fulfillment of federal treaty and trustee obligations with American Indian nations. A discussion will follow. Free and open to the community. RSVP to socialjustice@case.edu. Join us as activist, author, editor and scholar Don Freeman (CWR ’61) reads from and discusses his autobiography, Reflections of a Resolute Radical. A lifelong Cleveland resident and graduate of Glenville High School and Case Western Reserve University, Don will share thoughts about the civil rights movement, the rise of radicalism, and the community’s responses to both. Free and open to the community; a light reception will follow. Reservations requested to socialjustice@case.edu. Join Professor Stephen Crowley, Chair of the Oberlin College Political Science Department, for a conversation on Putin’s power. Professor Elliot Posner participated on an international Roundtable Panel on Brexit: Fin du partie? at the Institut d’Etudes Politiques, Aix, France, on November 15, the day British Prime Minister Theresa May held a major press conference concerning the results of the UK’s negotiations in regard to leaving the European Union.